Israel: What do Catholics believe about the Jewish people? Are Catholics into Replacement Theology? Wasn't the early Church "the Way"? Do Christian Jews need to become Gentile? Why move to Rome from Jerusalem? Israel: What do Catholics believe about the Jewish people? Are Catholics into Replacement Theology? “…the Church of Christ discovers her ‘bond’ with Judaism by ‘searching into her own mystery.’ The Jewish religion is not ‘extrinsic’ to us, but in a certain way is ‘intrinsic’ to our own religion. With Judaism, therefore, we have a relationship which we do not have with any other religion. You are our dearly beloved brothers and, in a certain way, it could be said that you are our elder brothers.” (Spiritual Pilgrimage, page 63). Before discussing the Catholic position on Israel, let us first examine Evangelical positions. There are conflicting views among Evangelicals over the Jewish people in the plan of God's salvation. On one hand there is Millennialism. On the other Replacement Theology. Catholics would say there are elements of truth at both ends of this continuum, but also fundamental flaws with both Millennialism and Replacement Theology. Very "into" modern day Israel and believe the Jews have a very important role in the end times. They foresee a huge mass conversion of the Jewish people. Jesus will come back to earth for a literal 1000 year reign and establish a kingdom based in the modern day state of Israel. Nothing special about non-Christian Jews of today. They are like everyone else (the Gentiles). Christianity of the New Covenant totally replaced Judaism of the Old Covenant. They believe Jewish individuals who surrender to Jesus will be saved but there is nothing special going on between God and modern Judaism. After the crucifixion, the curtain of the Jewish sanctuary was torn in two (Mk 15:37-39, Lk 23:44-46, Mt 27:51) and the fledgling Church became the New Israel. One might say God's marriage to his people was "consummated" at the Pentecost. Israel includes BOTH Christianity (New Israel), and it's older brother in the faith of Abraham (Jewish people yet to accept Christ). We don't think the Jews have been accursed. In the Old Testament, God did not abandon his people even though he allowed them to suffer. St. Paul makes it clear that the Grace and election they had received from God was irrevocable (Rom 11:29). Same principle with kings of Israel: David and his descendants superceded Saul and his son Jonathan. What about the poor treatment of the Jews by the Church? True, the Jewish authorities and those who followed their lead pressed for the death of Christ; still, what happened in His passion cannot be charged against all the Jews, without distinction, then alive, nor against the Jews of today. The Jews should not be presented as rejected or accursed by God, as if this followed from the Holy Scriptures. All should see to it, then, that in catechetical work or in the preaching of the word of God they do not teach anything that does not conform to the truth of the Gospel and the spirit of Christ. Since that time every pope has gone further in their statements about the Jews and the importance that we honour their special place. Pope John Paul II recognized Israel in 1994 as a diplomatic entity and was the first Pope inside a synagogue. Popes Benedict XVI and Francis have also visited Israel, entered synagogues and have expressed our repentance for actions against Jews. There was a false idea in the Middle Ages that since the masses of Christians were illiterate, they had to be protected from any influence that might espouse a different teaching. Christians thought they had to conquer countries and install Christian governments that could control the dissemination of information. Combined with that was the fact that it was a very violent and volatile time. Human rights belief was not at all developed. Ninety thousand Christians were slaughtered in 614 AD in Jerusalem, and the Jewish people approved of the slaughter. There were endless scuffles for limited resources, and fighting in places like Alexandria, and whenever there was oppression of Christians in those days, the Jewish people would never come to the defense of Christians, but rather they joined the persecution. Violence between people runs deeps and is long remembered. When Christianity finally dominated Europe, many Christians mistakenly let that rivalry continue rather than welcome Jewish communities among them. Unfortunately as Christians got stronger and stronger in Europe, there was greater prejudice. As he walked slowly across the stage of history, the Jew took on an uncanny resemblance to Jesus: beaten, spat upon, mocked, derided, bleeding from his judicial scourging, crowned with the thorns of incomprehension, bearing his cross on the way to Golgotha. Jewry ran the gauntlet of the nations...The Jewish Diaspora [Jews living outside of Israel] within Christian Europe ... is one long Via Dolorosa [Passion of Christ]." Like Jesus, Jewry was a victim; unlike Jesus, it was not pure and innocent. All the same, insofar as it was innocent of the monstrous calumnies of the anti-Semites, object of satanic hatred, of unjust prejudices and violent jealousy, Jewish suffering acquired a quasi-redemptive value, which all innocent suffering merits. The ultimate value of Jewish suffering should be sought for elsewhere than in the present. It lies in the future. The Exile may be compared to a coal mine, its dusty galleries dark and dangerous within, but once coal is extracted it is capable of furnishing light, heat and power to mankind. During the [Babylonian] Exile , Jewry stored up immense quantities of spiritual energy, waiting to be released when the Exile should come to an end. As he walked slowly across the stage of history, the Jew took on an uncanny resemblance to Jesus: beaten, spat upon, mocked, derided, bleeding from his judicial scourging, crowned with the thorns of incomprehension, bearing his cross on the way to Golgotha. Jewry ran the gauntlet of the nations. The Holocaust can be integrated into the framework of a Christian interpretation of Jewish history, but only by shattering the Gentile... [notion that the Jews need be absorbed into the Church without a distinct identity]. Jesus prophesied: “The Son of Man is going to be delivered into the hands of men who will put him to death, and he will be raised up on the third day" (Mt. 17:22-23). In these words Jesus prophesied his own death, the fate of his Mystical Body in the course of Church history and the fate of post-Christic Jewry. Jews, too, would be handed over to the Gentiles to be put to death by them, only to rise on the third day. Not even the feeling of being abandoned by God would be absent from the parallel. What is more, in Jewish martyrdom Jesus himself is martyred. This corresponds well with the intuition of the Jewish sages that God shares his people’s suffering. The accession [conversion] of Jewry to the [Christian] faith, far from being a break in Jewish history, will be its consummation; it will bring the Jew to the full consciousness of the sense of his own identity and existence. Once faith is given, Jewry will be transformed into a powerhouse of spiritual motivation, sufficient to bring about the “resurrection of the dead", the return to the faith of lapsed Gentility [the first world has all but abandoned all Judeo-Christian values]. Jews have suffered and continue to suffer in view of the role that they are destined to play in the salvation history of mankind. [at Vatican II] John XXIII threw open a thousand closed windows in the Christian soul, as if preparing to receive the ingrafting of the Jews; the Jews, as if in preparation for their ingrafting, set up a State and captured Jerusalem... Hayyim Hazaz, ... distinguished of modern Hebrew novelists, was prompted to write ... “And now, as in the last days of the ancient world, we are perhaps invited to save Europe from shipwreck". St. Paul echoes him: "For if their rejection means the reconciliation of the world, what will their acceptance mean but life from the dead?" (Rom. 11:15) The "full inclusion" of the Jews in the Messiah's salvation, in the wake of "the full number of the Gentiles," (Rom. 11:12, 25; Lk. 21:24) will enable the People of God to achieve "the measure of the stature of the fullness of Christ," in which "God may be all in all." (Eph. 4:13; 1 Cor. 15:28). What about a double covenant, should we just leave the Jews alone and wait for God to do the evangelization in one big shot? Modern Jews are only saved because they remain steadfast in their Messianic hope which properly speaking is fulfilled in Jesus Christ. Jesus is the END of the Mosaic law - both its goal and its terminus. The Catholic Church as an institution does not have an explicit mission to the Jewish community as a whole for a variety of reasons. However, the Vatican says Catholics should witness to individual Jewish people as the Holy Spirit leads. When Jewish people convert they should be allowed to preserve their unique identity? Elias Friedman makes it clear that any effective generalization of the Jews will need to guard the unique and cohesive nature of the Jewish people. 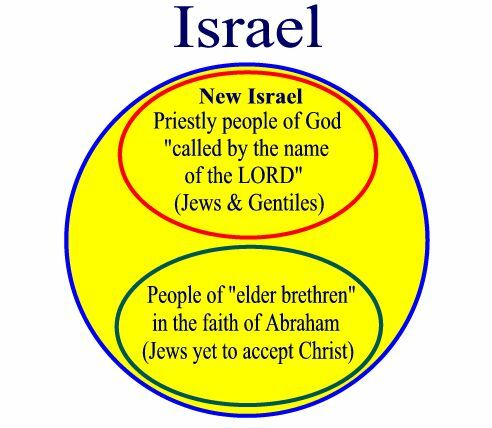 Christian anti-Jewish prejudice has not served the cause of unifying the older brother Israel (of the Promise) with the younger brother, Gentile Christianity. Catholics are coming to understand that the Jewish people who are called to the Church are not called to blind assimilation and absorption into Gentile Christianity. Jewish Christianity in the Catholic Church will need a distinct culture, a distinct calling, which includes cohesion among people of Jewish origin. Christians who try to convert Jews today will not get very far unless they take into account the distinct nature of the "older brother" and understand that the Jewish people are under the "regime of the Election". There is nothing inconsistent with the preservation of Jewish distinctiveness, and an authentic conversion to Christianity in the Catholic Church. Perhaps the Jewish people who convert will be under a Cardinal who is of Jewish descent, have their own liturgy if they want it, have a worldwide communication network unifying them, and much autonomy in cultural matters with respect to how they live out their calling in the Church. As more Jewish people become Christian, they have taught us something that has been wrong with Christian culture, which is an attitude of colonialism. There has been a false notion that Jewish people need to give up their Jewish identity to become Christian. We need to banish that from our thinking, as it's an anti-witness. Just as Christ showed Paul and Peter that Gentiles do not have to become "Jews" in order to be Christians, we need to be careful not to require Jews to strip their "Jewishness", in order to be Christian. They must be able to maintain their Jewish identity. The following is an excerpt from an interview with Brian Robbins, a Jewish convert. Marcus Grodi: "Did your journey into the Catholic Church help you appreciate the beauty of the heritage you brought with you?" Brian Robbins: "It really did... as I put it to my parents, I became a much better Jew when I became a Christian ...I want to qualify that: Jesus was a Jew, Mary was a Jew, Joseph was a Jew, all 12 of the apostles were Jews, every author of every book of Scripture, except Luke, were Jews." "I say that because we need to recognize the roots of the faith and the lens through which the original audience that it was intended for was reading this... Christianity is at its heart Jewish. Paul in Romans talks about the Gentiles being grafted in to the promise of Israel... it's not trying to recreate or layer on top of the Mosaic law, but the Mosaic law was pointing to something which is a natural completion. So we would expect to see within Christianity elements of Judaism, and in fact the early Church was so Jewish there was actually a debate about whether Gentiles would need to become Jews to become Christians (Galatians). Do the Gentile believers need to be circumcised and follow all the laws of Moses in order to become part of the Covenant Community? The answer was absolutely "no". Ironically we've come full circle and ... for a lot of people a legitimate question is if a Jewish person comes to Christ do they have to cease to become a Jew to be a Christian the answer to that is also "No!"... the Jewish roots of the faith are extraordinary." Did Early Gentile Christians hijack Christianity from the Jews? Modern Messianic Christians think Gentiles should have been grafted into the chosen people (the Jews). They say that Gentile Christians hijacked Christianity from the early Jewish Christians. These denominations sprung up in the 20th century and have no direct lineage to early Christianity. Their theology does not line up with the writings of the first centuries, nor do they line up with each other. The Church is the Bride of Christ and the New Jerusalem (Rev 21:2) and the keys of the New Covenant were handed over to Peter and the Apostles and his successors (Mat 16:18). The emerging structure of bishops, jurisdictions, and theology is a result of that authority. St. Ignatius used the term "Catholic Church" in about 110 A.D., 20 years after John wrote his Gospel. Where the bishop is, there let the people be, as where Jesus is, there is the Catholic Church. Ignatius 107 A.D. The structure of Israel changed many times over the course of history. Aaron and Moses appointed 70 elders, Samuel annointed Saul as the first of many kings. The kingdoms divided, etc. The structure of Israel changed again with Christianity. A timeline of the Catholic Church is here. The story of Jesus very much follows the Jewish calendar, not because Christians copied the Jewish festivals, but because historical Christian events happened on those days. Christians didn't make up the dates of these events, such as Jesus death, resurrection, Pentecost etc... This, we believe is an amazing act of God to show Jesus as the fulfillment of Jewish prophesy. When we do the math, the 10th day of Nissan, Jesus enters Jerusalem, declared by Pontius Pilate to be without blemish. Festival of first fruits: is on the 1st day following the 1st Saturday of Passover, grain offering to the Lord so the rest of the crop would be acceptable. Jesus Crucified on Friday the Sabbath, He arose from the dead on Sunday, which was on the Jewish festival of First Fruit. He is described as First fruit in Scripture pointing to him being the first to be resurrected from the dead. Jewish harvest festival of Shavuot: is 50 days after the Passover. Commemorates Moses coming down from the mountain with the 10 commandments. The word of God written on stone. the first time he came down they were worshiping the golden calf idol. Pentecost: Ancient Greek: Πεντηκοστή [ἡμέρα], Pentēkostē [hēmera], "the Fiftieth [day]"
Pentecost Holy Spirit lands of the apostles, and they were all speaking in tongues, preached, and 3,000 were saved by becoming believers. This is the same day as Shavuot. The above Festivals show a correspondence of historical events in which Christianity fulfills Jewish Prophesy. Below is a chart of what we believe the future will hold, based on Biblical prophecy. 2nd coming of Christ, Jesus said, "you will not see me again until you say Blessed is he who comes in the name of the Lord." Book of Revelation trumpets herald the coming of Christ. Scripture tells us to repent in preparation. In the Bible and early Church, wasn't it called "the Way" rather than Orthodox or Catholic? In Acts, Jewish Christians used the "the Way" when speaking to Jewish people who didn't recognize Jesus as the fullfillment of Israel It was to destinguish Christianity from other Jewish "ways" (Pharisees, Sadducees, Essenes, Zealots, etc.) who did not recognize the true King of Israel, the only "Way". The "Way, the Truth, and the Life." When Gentile Christians spoke of the Church, they stressed its truth and its universality; and this is why and how the terms "Orthodox" and "Catholic" were applied to the Church from the time of the Gentiles. And those two terms exist today. Moved to a separate article. Why do Catholics use of Greek Philosophy in Christianity? Did Catholics Hellenize the Church? Thanks to Art Sippo, Mark Bonocore, Fr. Terry Donahue, Marty Barrack, and John Pacheco for contributing ideas for this article. Where is Golgotha? Where did Jesus Die?